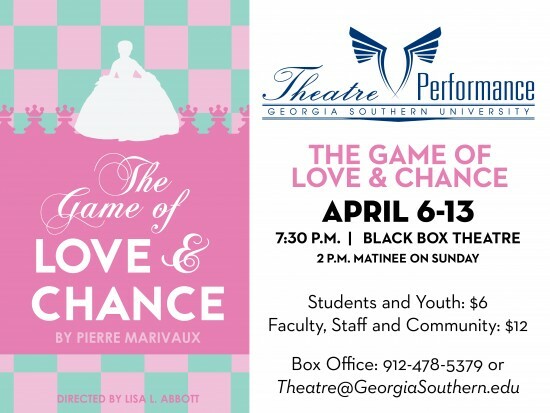 The Theatre & Performance program at Georgia Southern University closes the main stage season with Marivaux’s farce “A Game of Love and Chance” at the Center for Art & Theatre’s Black Box theatre April 6th through 13th. To Silvia, betrothed to the moneyed and majestic-looking Dorante, good nature means more than good looks, reason more than riches. It is not the lure of love that interests her, but its everlastingness. Her maid Lisette does not bother her head about all this; she simply dreams of a man– any man! A hilarious game of love plays out as characters don disguises to find the path to true love. Set in the 1750’s this comedic look at the game of love features fantastic period costumes by Dr. Sarah McCarroll. The cast features Sam Wise and Kelsey Poole as the young lovers who want to find the perfect match and Devyn Crawley and Will Cox as the over the top servants in disguise. “A Game of Love and Chance” opens on April 6 and runs through Wednesday, April 13th. There will not be a performance on Monday, April 11. All shows begin at 7:30 pm with the Sunday Matinee at 2:00 pm. Student and youth tickets are $6. Faculty, staff and community tickets are $12. All seating is general admission. Group prices are available, contact the box office for information. The house opens at 7 pm and we encourage audience members to arrive no later than 7:15 p.m. to ensure good seats. The balcony will serve as overflow and late seating. Call the Box Office in the Center for Art & Theatre at 912-478-5379 to make reservations. Reservation requests can be left on box office voicemail 24-hours a day. You can also purchase tickets online at Theatre & Performance Marketplace or by emailing us at theatre@georgiasouthern.edu.